Tea tree, sometimes spelt ‘ti tree’, is an essential oil with a pungent, fresh, medicinal aroma which has a slightly spicy, powerful undertone. Although tea tree oil is relatively new to aromatherapy when compared to other essential oils, it is now widely used for its antibacterial, antiseptic and stimulating properties. Tea tree essential oil is extracted from the leaves or twigs of the plant by steam or water distillation. 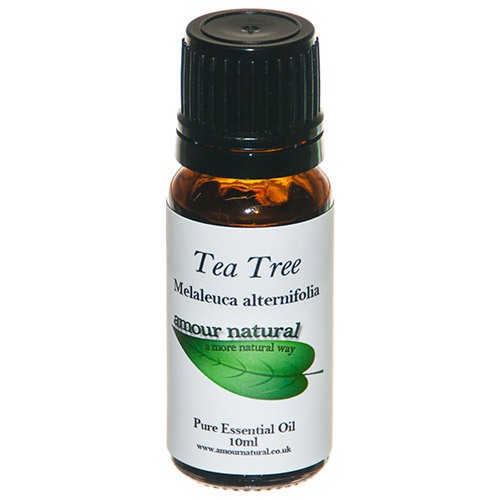 Tea tree essential oil blends well with spice oils, as well as lavender, rosemary, pine, ylang ylang and marjoram. Tea Tree Pure Essential oil. Below are reviews of Amour Natural Tea Tree Pure Essential Oil - 10ml by bodykind customers. If you have tried this product we'd love to hear what you think so please leave a review. I cant praise Tea Tree oil enough. It has so many uses, I would be lost without it. This item arrived quickly and its a decent size bottle too. I would definitely buy from this seller again. Whilst travelling in air conditioned public transport, I use a couple of drops of tea tree in a tissue to inhale, helping to keep my airways clear. This product is available in various bottle sizes, 10ml size ideal for pocket carrying. Great service from bodykind as always. Extremely pleased with recent purchase of Tea Tree Oil, your prompt response and rapid delivery very much appreciated.